Europa Report (2013) - Sci-fi-central.com.  USA  2013  90m   Directed by: Sebastián Cordero.  Starring: Daniel Wu, Sharlto Copley, Christian Camargo, Karolina Wydra, Michael Nyqvist, Anamaria Marinca, Embeth Davidtz, Isiah Whitlock Jr., Dan Fogler, Neil deGrasse Tyson.  Music by: Bear McCreary. The science in this film was absurd and implausible; the first manned mission after the Moon is Europa, not Mars. Why Europa? Nobody knows. And most presumably no probes or robots were sent to Europa in advance. Everything that was portrayed by astronauts in the film has already been done by current, actual robots in Mars; so why the need to send people to Europa? It looks so weak as a PR move by a corporation. The whole Hydrazine premise is so ridiculous. There was absolutely no justification for so many space walks in such weak suits: fixing batteries and fuses, correcting icing problems in fuel lines... When the time comes for a real-life manned mission to get beyond the Asteroid Belt, you bet that mission will have thousands of safeguards and protection against common things that happen in space like radiation, solar storms, asteroids, battery failures, and icing. The writers probably ignored such basic planning for the sake of dramatic effect, as if a corporation would risk lives with sloppy mission design in this kind of PR move. The only possible exception for this scientific mess is the artificial gravity, which is produced by the fool-proof rotating module that we have seen in other films, and even then who cares? They got the Jupiter-Europa gravity all wrong. The writing was terrible: the retrospective to the launch events was absolutely unnecessary. Precious time that would have been best invested in character development. Nobody cares about your characters, their intentions, motivation, relationships, deaths, nothing. They enunciate their motives for giving up their lives, but you can be sure they don't feel like saving the day; they might as well let the mission fail. Real-world astronaut training is not Kamikaze training. Real-world astronauts are naturally afraid to die, just as everyone else; in such vein they are trained not to attempt stupid stunts like going after the light or walking without tethers. The writing is so poor that you could switch the characters in their roles, you could change the whole premise to an expedition to the Arctic, like The Thing, or something like The Abyss with little change. No tension, no climax, no suspense. The whole documentary format was also unnecessary; it had no purpose; it doesn't even look as a direction or art device; I am pretty sure it happened at the editing room: they first tried the basic sequential cut, and then they tried to rearrange the scenes without adding or removing anything, and found it more interesting; anyways the film makes the same sense: none. There is a reason I don't spend two hours of my time watching security footage: because it's boring. But then there I am, watching security footage of a bunch of people I couldn't care less about doing some implausible things for the sake of dramatic effect. Gratuitous close-ups of nostrils and teeth. I feel ripped off. I think every take on Jupiter, Europa, and the creature were also represented from the point of view of the fixed cameras, so the visuals there are super-boring. The creature had more tentacles than animation frames in this film. Terrible lighting. There are three exceptions to this visual nonsense: the solar storm is pretty good, the ship sets are decent, and the theatrical release poster looks way better than the film's Europa footage. Unimpressive film. Finally, the acting; I'd really like to say that the good actors had poor material to work with, and that their talents were wasted. But I strongly believe they were so bored with the premise and script that they didn't even care about their performances. Killing Copley off so early was a terrible move, but who cares anyway? Keeping him to the end does not help things. This film is a fantastic example of how not to make sci-fi. Review by Fabio Correa from the Internet Movie Database. 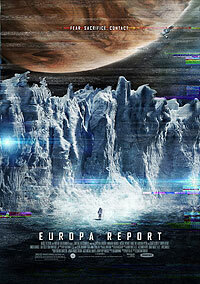 ̏Europa Report� - A Film for Real SCIENCE-fiction Lovers. LA Film Fest – �eEuropa Report�f.